This dictionary aims to dispel any confusion that arises from the misinterpretation of language. It provides explanations of over 5000 idiomatic expressions and a useful guide to their politeness level. Each expression is accompanied by a clear explanation of its meaning and when and how it might be used. As awareness and diagnosis of Asperger Syndrome (AS) increases, it is essential that every teacher has a familiarity with the condition and understands how best to support AS students. This fully revised and expanded edition is the ideal resource to point teachers in the right direction. 1. So what is Asperger Syndrome? 2. What signs might a child express? 3. What are some strategies for the classroom? 4. Can I help a child with their social skills? 5. How can I help them in the playground? 6. What should happen before the child changes class or school? 7. Should I make the child do homework? 8. How can the child be assisted with study? 9. What should the teacher aide be focusing on? 10. Who else in school needs to know? 11. Am I qualified to teach this child? 12. I want to know more. Where should I start? This forward-looking book focuses on building individual strengths and resilience, rather than modifying perceived weaknesses, through individualized therapy within a group context. Integrating psychological and educational theory with a variety of creative therapies, Judith Martinovich combines activities such as art making, drama, music, puppetry, yoga and photography with conventional cognitive-behavioural interventions to support individuals with AS. Covers the range of intellectual ability from those having severe learning difficulties to those of above average intelligence. Practical advice for those working with children from pre-school to post-16 is given on - choosing the appropriate educational placement, creating an effective educational environment, working with staff and other children to maximum effect, writing effecting individual education plans, working with parents and families, enabling a smooth transition between classes and stages of education, life beyond school. Meeting a growing need for school-based practitioners, this book provides vital tools for improving the academic, behavioural, and social outcomes of students with high-funtioning autism or Asperger Syndrome. Research-based best practices are presented for conducting meaningful assessments, collaborating with teachers, students and parents to prevent school difficulties and problem solve when they occur: and developing effective individualized eduation programs in a large-size format with lay flat binding to facilitate photocopying, the book features a wealth of practical prevention and inervention strategies, illustrated with oncrete examples. Over a dozen reproducibles, include interview formsd and observation sheets. Finding a way of simultaneously addressing the sensory, motor, emotional, communicative, cognitive and social needs of children on the autism spectrum can be a real challenge, and choosing from the vast array of options available is a daunting task. This book provides a blueprint for an educational intervention program that is evidence-based. 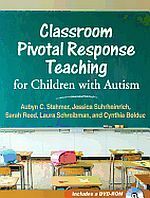 Providing easy to follow, proven strategies for common teaching challenges, Making it a Success is a user-friendly resource to help teachers and teaching assistants effectively integrate students with special needs into the classroom. With photocopiable worksheets, creative ideas for activities and teacher notes, Sue Larkey presents effective ways of helping children with autism spectrum disorder (ASD) improve their social skills, reading, writing and maths, play and general behaviour. She provides solutions for dealing with constant questioning in the classroom as well as managing children's special interests and obsessions. Making it a Success introduces strategies that are applicable not only to students with ASD but also to those with a range of special needs and is an essential resource for all those working in integrated classrooms. Dr. Kirstina Ordetx provides an accessible overview of the key concepts of ToM, and explains how to assess each child's readiness for the curriculum, suggesting practical ways in which to support those who do not yet meet the minimum criteria. Twelve 60-90 minute lesson plans for use with small or large groups of children aged approximately 7-16 are then presented, each of which is accompanied by a photocopiable letter to provide parents and carers with suggested activities for practicing and reinforcing the concepts and skills learnt at home. The lesson plans are engaging and varied, and are grounded in Cognitive Behavioral Therapy (CBT), an approach which is recognized as one of the most effective methods of providing developmental interventions to children on the autism spectrum. All of the supplementary materials needed to teach the curriculum are included in the book: a photocopiable assessment checklist, a photocopiable social skills poster, and over 200 cut-out-and-use flash cards.